Okay, so remember a long time ago when I made bagels? Yeah, I haven't made them again since. And you know why? Because they take foreeeeeeeeever to make. 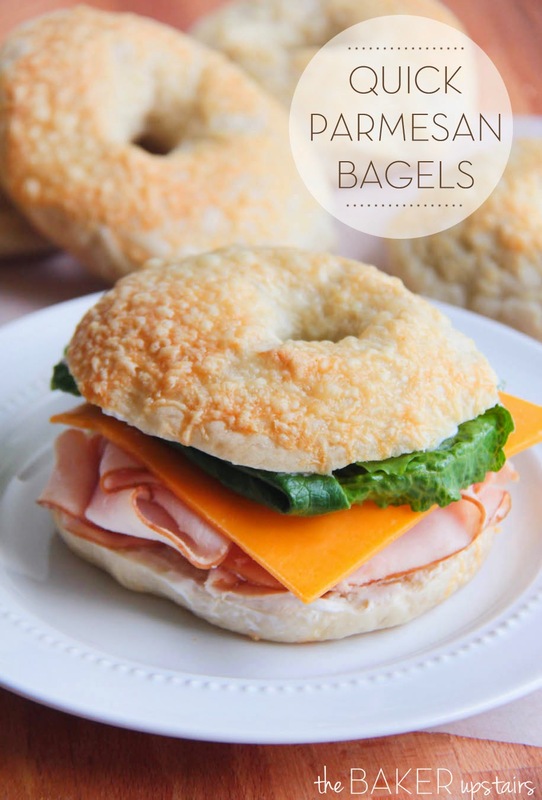 I love bagels, and when the craving strikes, I want them now, not 24 hours from now! Don't get me wrong, those bagels were super delicious, but I just needed a quicker recipe to use regularly. I found this awesome one on How Sweet It Is (which is seriously one of the best food blogs out there) and was excited to give it a try. 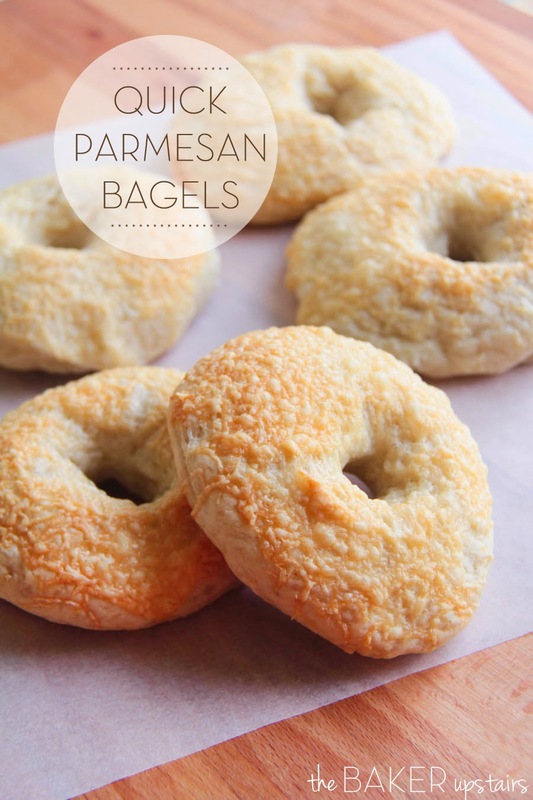 These quick parmesan bagels were the result, and they are amazing! Yes, they're not instant... they still take about two hours to make, but two hours is a lot better than 24! 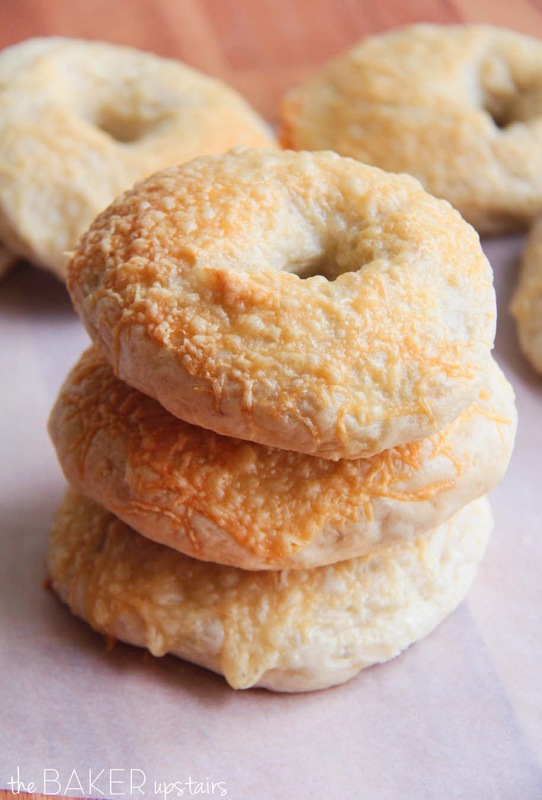 These bagels are perfectly chewy on the outside, soft in the middle, and crisp on top from all the delicious cheese. My girls loved these bagels and kept asking if they could have them for every meal. They liked them plain, but I made mine into a turkey sandwich, and it was really tasty. These are definitely on my list to make again! In a large bowl or the bowl of a stand mixer, combine the warm water, yeast, and honey. Let sit until bubbled and foamy. Add the salt and 4 cups of flour, and mix until combined. Add the remaining flour, 1/4 cup at a time, until a smooth and non-sticky dough forms (I used about 5 cups total). Knead until elastic then place in a lightly greased bowl to rise until doubled in size, about one hour. After one hour, punch down the dough and divide into 12-15 equal sized pieces. Roll each into a ball and place on a lightly greased baking sheet. Cover and let rise 30 minutes. While the dough is rising, grate the cheese into a shallow dish and set aside. After thirty minutes, push your finger through the middle of each bagel to make a bagel shape and return to the baking sheet. Preheat the oven to 400. Love how quick these are, nothing like a freshly made bagel! !